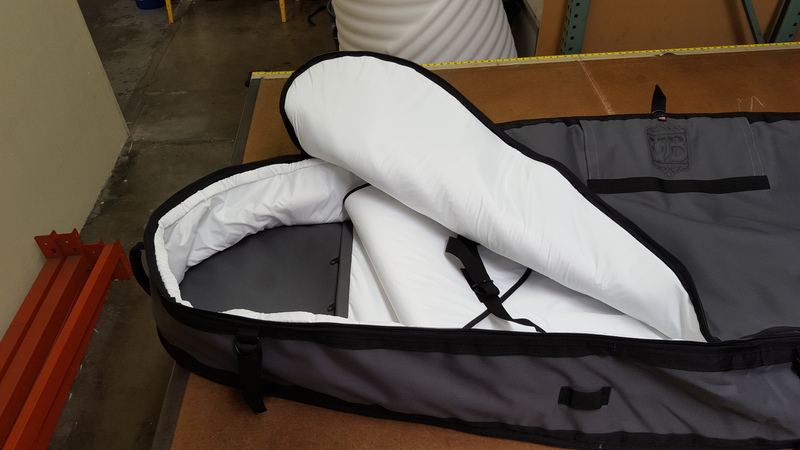 A Custom Vitamin Blue 8’3″ coffin travel bag for Jarrod from Hermosa Beach, California. Enjoy your SUP surf trip!! This coffin bag includes charcoal gray 600 denier with pvc backing exterior. This darker color bag will hide dirt better when traveling. .50″ foam padding and smooth white nylon interior. Also included are three handles (nose, center sidewall and tail). And a full length zipper with two zipper sliders and a zipper protection guard. A shoulder strap and exterior Velcro pouch for storing shoulder strap when not in use. Additionally, inside are a white nylon .25″ foam board divider panel and two 1.5″ board tie down straps with metal d-rings. Furthermore, all the panel edges (top, sidewall and bottom) are reinforced with 1.5″ webbing to prevent the seams from tearing open. There are three tie down compression straps with metal d-rings on each side of the bag. Also on each side of this coffin bag are two tie down loops for securing the bag with tie down straps to the roof of a rental car. In addition, inside the coffin travel bag is a zippered accessories pouch for your fins, leashes and other surf trip essentials. Also we can make you a custom travel coffin bag with wheels for your surf sup travel bag, coffin surfboard bag, coffin longboard or gun surfboard travel bag. Finally, for a coffin bag price quote you can email us at contact@vitaminblue.com or call 949.645.4592.